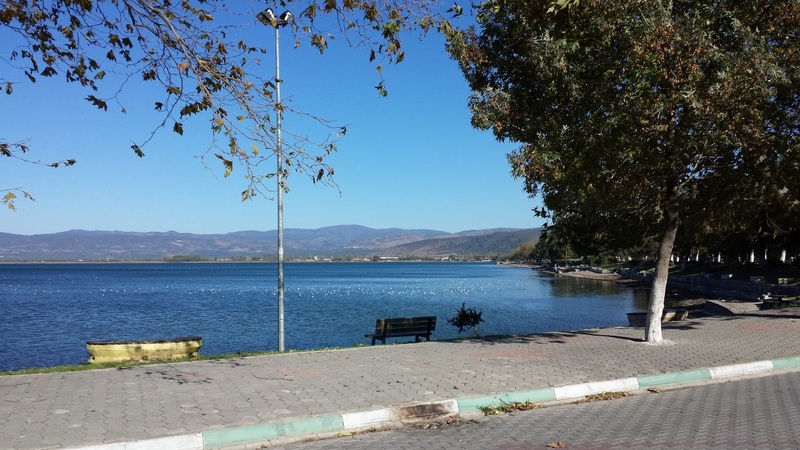 I have just returned from a coach tour around parts of Turkey. 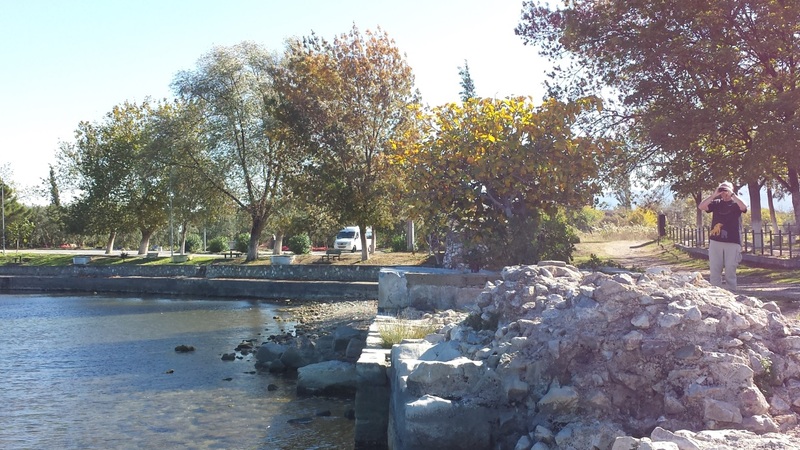 One of the places visited was Iznik, formerly Nicaea. Nicaea stands at the eastern end of a substantial lake, and at the western end of a considerable plain filled with endless olive groves. The lake itself is surrounded by mountains, with a breach at the western end through which the lake waters empty into the sea. 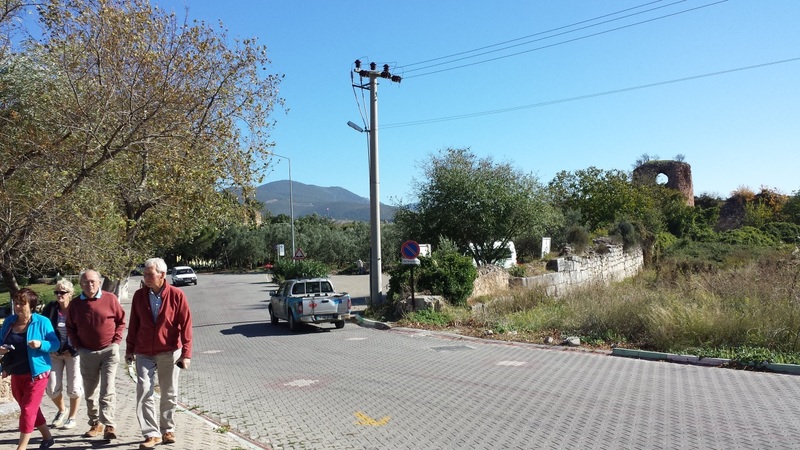 The town is now little more than a village, but it still shows the Hellenistic street plan. 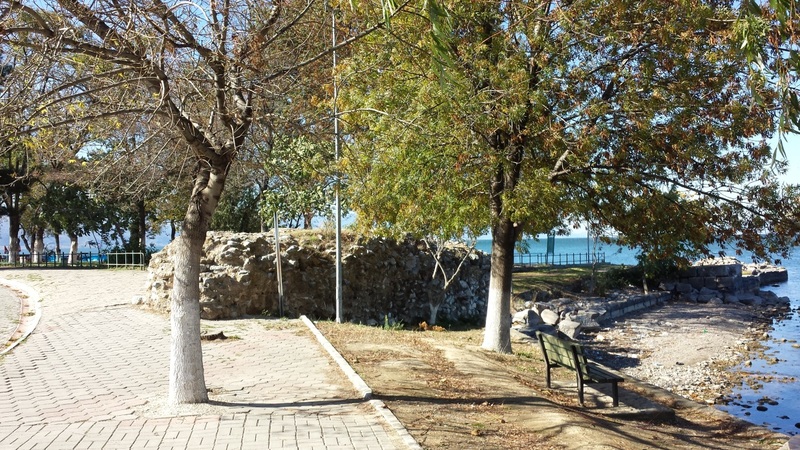 It is surrounded by two sets of tremendous medieval walls from the Byzantine period. The gateways themselves are Roman, built in Trajan’s reign, and incorporated into the Byzantine walls. The walls also run along the lake-side. 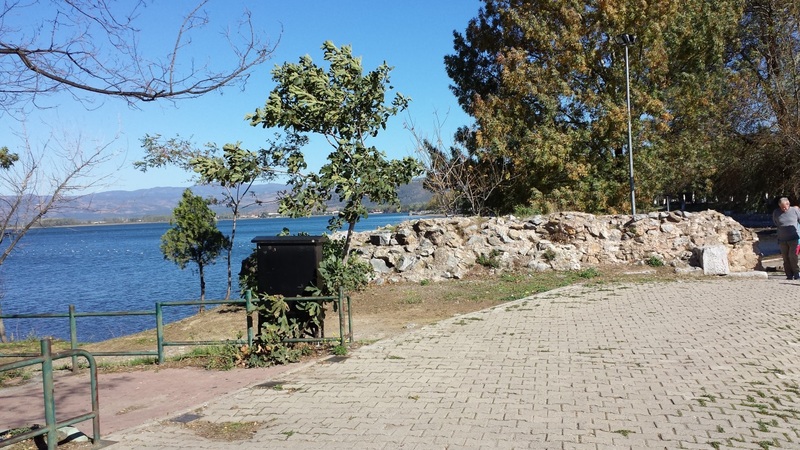 It is a tranquil, pleasant place, and a house in Nicaea overlooking the lake would undoubtedly be a restful place to be. When our party were driven down to the lake-side, we were intoduced to the remains of a stone structure running out into the lake. This, we were told, was the “Senatus Palace”, built by Constantine, and in which the First Council of Nicaea was held. One would not, of course, trust unreservedly any statement uttered by a dragoman, from whatever source, but it is certainly the case that there is masonry here, and fragments of the Roman town. It would be entirely remarkable if the site of the council was still to be seen. Unfortunately I have been unable to verify any of the information given. The following photos were all taken on the spot. I have been to Nicea too, a few years ago though I mostly walked in the Byzantine walls along with two monks. They told me that indeed it was by the lake that the first ecumenical synod took place, your pictures fit the description. In the center of the city is what is left of the church where the 7th Ecumenical Council took place. It was turned into a mosque (and structurally stabilized) by Sinan, the Armenian convert to Islam who made Agia Sophia into a mosque. It is still standing minus the roof and I remember that the entry price was quite reasonable. The Aya Sophia church has now been reroofed and turned into a mosque (so no entry fee). It’s not really used, tho. I had read before that the site was underwater. It would be interesting to take some camera equipment with a diver and see if it could be filmed. Wouldn’t it?! I bet it could be done. 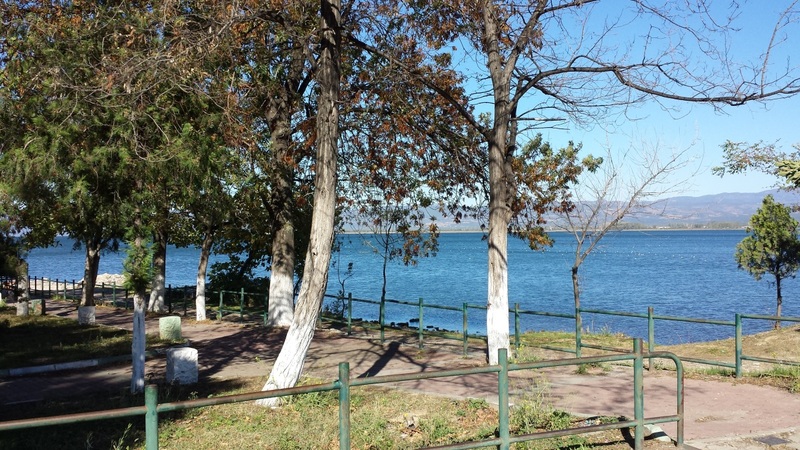 The region is a lovely place … and day-trippable from Istanbul. 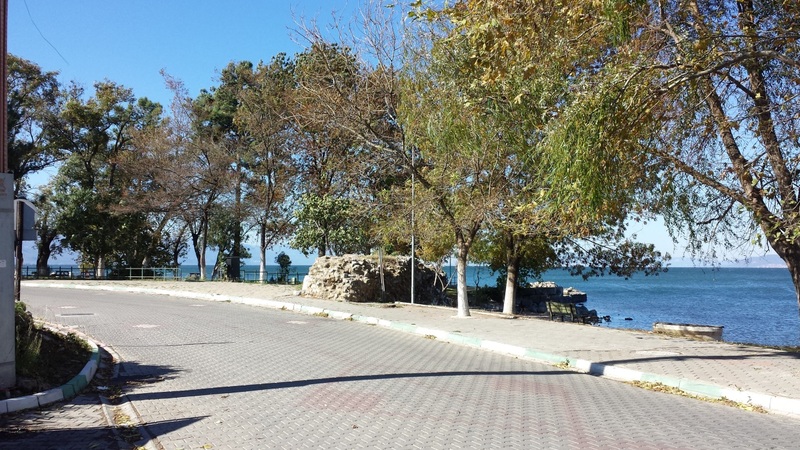 I have attached a link to a Turkish newspaper article from earlier this year announcing the “discovery” of an underwater Basilica 20metres off the coast of Iznik, in water about 2metres deep. The underwater ruins were spotted during an aerial survey of the region by the local administration. The area is likely to be declared a SIT area (attributed to areas of archeological/historical significance) and would thus render the area off-limits to diving. Thank you for this. It is interesting, isn’t it?